In a country both as vast and as rich in natural beauty as Australia, a road trip can offer a great way to see as much as possible, however long your trip may be. Combine the rural outback, the majestic coast, top cities and colonial towns and you’ve got the adventure of a lifetime. Pack your bags, load up the hire car and pop on your favourite tunes as you cruise to some of Australia’s most beautiful spots. 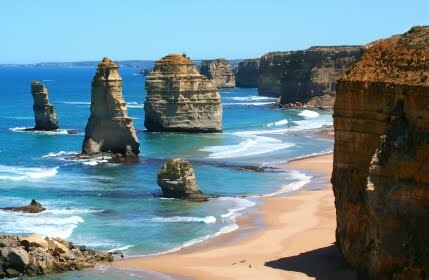 The iconic Great Ocean Road (above), which connects Melbourne in Victoria to Adelaide in South Australia, is one of the world’s most scenic and famous coastal drives. There is much to see along the way, including the ancient rainforests of Great Otway National Park, native wildlife in a sanctuary within an extinct volcano, mountain lakes in the Otway Ranges, and wineries in the Geelong and Henty wine regions. However, the highlight has to be the dramatic rock sculptures that make up the 12 Apostles. For pristine, untouched coastline away from the madding tourist crowds, a trip up Western Australia’s stunning Coral Coast is a must. Eat lobster in Geraldton, see the spectacular coastal blow holes 70km north of Carnarvon, swim with whale sharks and snorkle in the underwater coral gardens of the Ningaloo Reef, play with dolphins at dawn in Money Mia, and chill out at some of the region’s hundreds of empty beaches along the way. Tasmania’s rugged, wild west coast is perfect for that ‘get away from it all’ trip. Visit quaint fishing villages, winding rivers, one of the world’s top ten beaches, awesome Cradle Mountain, Australia’s deepest lake, enjoy a chairlift ride across deep Cataract Gorge, spot a Tasmanian Devil, and sample Tasmania’s legendary produce, including cheese, honey, smoked salmon and wild trout. Just be sure to leave the car often to trek through the island’s stunning wilderness and work off some of that food! Sydney Opera House, Sydney Harbour Bridge, Darling Harbour and Bondi Beach are all iconic Australian landmarks and a great way to begin your trip but just 50 minutes from the bustling city lies one of the most beautiful national parks in the world. The Blue Mountains is a World Heritage listed natural stunner and a road trip will take you to stunning Wentworth Falls, to Echo Point to enjoy awe-inspiring views across to the Three Sisters, to the world’s oldest open cave, and to small towns full of history and character. Emily Buckley has journeyed across the world in search of the best road trips and Australia, with its raw beauty, ruggedness and sheer scale, rates highly on the list. It helps that accommodation options are plentiful and easily (and cheaply!) booked via a specialist online company such as Hotel Club. By using Hotel Club Sydney, Melbourne, Adelaide, Perth, Brisbane, Hobart, and Darwin hotels are just a click of a mouse away. NOTE: This is not my own experience, but instead one provided by Hotel Club Sydney. Please visit their site for more information.